Snow on the prairies and ice crystals dancing in the air above the Assiniboine river… Winter finally caught up with the Kitchen Party at our last event, in Winnipeg. It was a mighty finale! Many of the superstar athletes who have been our most ardent supporters over the years were on hand, including Curt Harnett, Marnie McBean, Derek Drouin, Erica Wiebe, Simon Whitfield and Manitoba’s darling, Cindy Klassen. Their good friend and ours, Canada’s primo sports broadcaster, Scott Russell, was our eloquent emcee, the sold-out crowd of 620 hanging on his every word. Huge kudos to our new Winnipeg chairs, Tina Jones and Ramona Thomson, who sold over 60 tables – or in some cases coffee tables, for the VIPs sat on luxurious white leather sofas at the front of the celebration room, leaving just enough room for the merry mosh pit that evolved as the music got going. For that, we must thank our brilliant front man Jim Cuddy who was joined by the superb Anne Lindsay on violin, Devin Cuddy on piano, Sam Polley on guitar, and Gianni and Tally Ferraro, coolest of the cool, providing the rhythm section. Last night they were joined by the great Johnny Reid with Michael Shand and Miku Graham, rocking the house with some of the music they’ll be playing on our trip to St. Lucia next year. What a party it was, and what a stellar way to finish our 2018 campaign! The culinary arts were equally well supported. It was a pleasure and a privilege to judge the competing chefs with a fine group of judges, led by our Senior Judge for Winnipeg, chef, educator and nationally recognised baker and culinarian, Barbara O’Hara. Tasting with us was chef and educator, senior judge emeritus, Jeff Gill; award-winning writer and broadcaster, Arvel Gray; writer, critic and author of Out of Old Manitoba Kitchens, Christine Hanlon; and food writer, broadcaster and main man at Peg City Grub, Mike Green. Normally we would also be joined by last year’s gold medal winner but Chef Mike Robins is cooking elsewhere these days, so we were honoured when Chef Cameron Huley of Winnipeg Squash & Racquet Club agreed to take his place. Chef Huley was also one of three chefs featured in the Chef Showcase – a new idea for the Kitchen Party where invited chefs prepare a dish for our guests without the stress of actually competing in the competition. 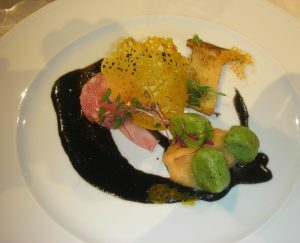 Huge thanks to Chef Huley for that and to Chef Tristan Foucault of Peasant Cookery, and Chef Luc Jean of Mon Ami Louis! Who ended up on the podium? We awarded our bronze medal to Thomas Stuart, chef of Thermëa by Nordik Spa-Nature. He took gorgeous local pickerel and poached it in butter then laid the tender fillet on a slab of lightly toasted sourdough bread spread with a cultured cream cheese flecked with dill. Dill pollen, Maldon salt, dill fronds and micro-fronds garnished this take on a Scandinavian smorrebrod and the plate was decorated with flower petals and two fluid gels, one flavoured with hibiscus and bergamot, the other with white wine and elderflower. Their tangy intensity was precisely calibrated to match his chosen wine, the 2015 Lock & Worth Semillon from the Okanagan, which cut through the buttery richness of the dish in a delightful way. Our silver medal went to Heiko Duehrsen of Assiniboine Park Conservancy. 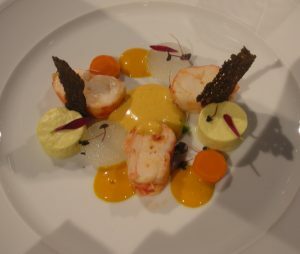 He chose lobster as his primary protein and butter-poached it to perfection, setting three juicy medallions in a beautiful presenation. Beside them were trembling pucks of a delicate bavarois of cauliflower, saffron and coconut milk, grouped around a sabayon spiked with garam masala spices. For contrast and colour, he gave us dime-sized slices of pickled carrots, then used the pickling brine to make a thick carrot vinaigrette. Daikon braised with lemongrass and ginger brought in East Asian flavours while elfin, lacy crisps of squid-ink-tinted brioche added textural crunch. Micro-basil sprouts and chrysanthemum petals upped the visual ante even further. Chef’s wine was the slightly off-dry 2016 Cave Spring Riesling from Niagara. 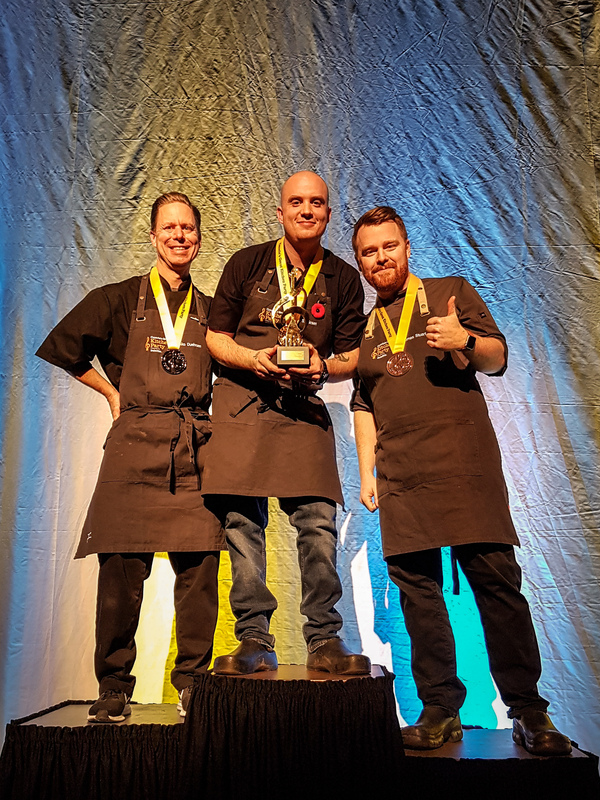 Jesse Friesen of The Merchant Kitchen won our gold medal – by a considerable margin. He created a dense terrine of wild boar and lobster studded with motes of foie gras – luxe textures and subtle flavours that harmonized beautifully. As a modern nod to the classic notion of aspic on a paté, he made a delicate jelly out of pickled onion brine, set with agar, and laid a translucent postage stamp of it over the terrine. Nudging up against it was a mound of silky, lightweight rutabaga and horseradish purée, the potentially aggressive flavours toned down to flatter not overwhelm the dish. On top of that, he placed three little ricotta gnudi, richkly textured and flavoured with pesto. A slice of king oyster mushroom, scorched with a blow torch, echoed the texture of the terrine and added a lovely earthiness, echoed by a little shaved truffle. A dramatically black sauce was made from lobster bisque stained and salted with squid ink. 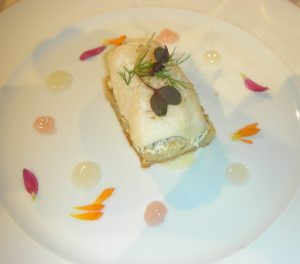 A brittle saffron tuile was the dish’s jaunty envoi. It sounds busy but there was much thought and wisdom on the plate and all the elements were perfectly in tune. Chef’s wine was the refreshing and palate-cleansing Blue Mountain Brut from the Okanagan. 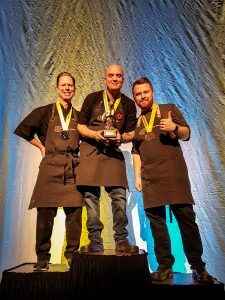 We judges had a strong sense that Chef Friesen was eager to return to Kelowna next year (he has won our competition before) and his dish was a convincing passport. So there we are. We have found our champions from across this enormous country and I’m thrilled at the idea of tasting their talents again at the Canadian Culinary Championship. It will be a remarkably even field and if I had to bet on who will end up on the podium in February, I would have no idea where to put my money. I can’t wait to find out what happens.